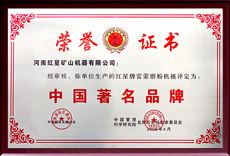 After 30 years of reform and development, Hongxing company has achieved numerous honors, including various kinds of certificates and awards issued by government organizations, media and marketing research organizations, the praise and approval of the public through formal or informal channels. All of these honors, are incentives deigned by the society and public to Hongxing company , are the recognition of vast consumers to Hongxing products , are the best testimony for public praise of Hongxing brand. 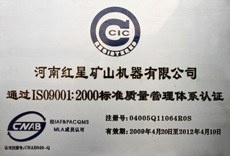 In April 2005, Hongxing passed the quality authentication of limited company by China Inspection Certificating Group, obtained the ISO9001:2000 Quality Management System Certification. Therefore, our internal organization management is more perfect, product quality and competitiveness have also improved substantially, meanwhile it helps our better international development and international communication. 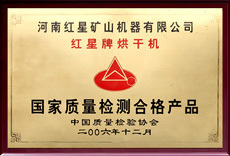 In view that the favorable quality and good reputation of Hongxing equipment for long term, International Brand Association of China and Famous Brand and Market Expert Committee of China Management and Science Research Institute in April 2005, issued " famous brand of China" certificate to our company, as excitation! In line with the production and sales principle of "the quality is always prior, the good faith is supreme", Hongxing has regarded product quality as her life, all customers as God, in view of which, in December 2003, Chinese Quality Inspection Association issued" the Qualified Products of? 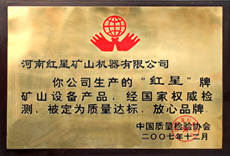 National Quality Inspection " to our company, as encouragement. Through indefatigable design pursuit and product improvement for more than ten years, mining equipment products of "HONGXING" brand manufactured by our company, passed the state authoritative test in 2001, was designated the quality standard, assured brand, which provides a strong support for the product sales, and opens a brand-new situation for our company.